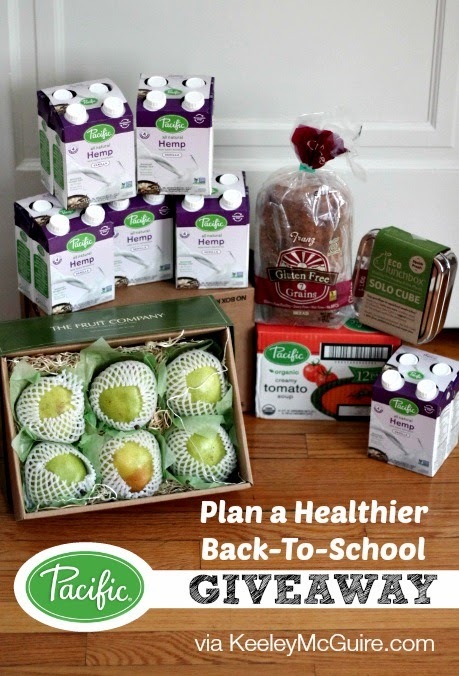 Pacific Foods has partnered with a few bloggers, as well as, USA Pears, ECOlunchbox, & Justin's Nut Butter to launch a Back-to-School Campaign on Packing a Healthier Lunch! I'll be sharing a new post each day this week (Monday through Friday) with a yummy lunchbox idea & recipes - so make sure to come back each day to see what's fresh! You'll also get the chance to WIN a huge prize package from the above mentioned brands (except Justin's we opted out because of Little Miss' allergy) exactly like the one we received and you'll find pictured in the post below, including a yummy loaf of gluten free & allergy friendly bread from Franz Bakery! ENTER TO WIN!! First up, I'm sharing a recipe that's a play on an old classic - Tomato Soup Cake. Only ours are muffins, healthier, gluten free, allergy friendly, and perfect for lunches! Pacific Foods Organic Creamy Tomato Soup is Little Miss' favorite! We'll share more about it later in the week with her favorite way to enjoy it, but I wanted to come up with a creative new way incorporate it in lunches, besides just packed into a thermos. Back in the 50's, Tomato Soup Cake became a "thing" as popularity with convenience foods were on the rise. If you ask your grandmother, or even your parents, I'm sure they'll remember enjoying it at one point in their life. I wanted to create a play on this yummy recipe by incorporating Pacific Foods delicious tomato soup, but also keeping it gluten free and allergy friendly. The soup does contain milk, but it's gluten free, wheat free, soy free yeast free, & more. You can download their product information/ allergen guide by clicking here. 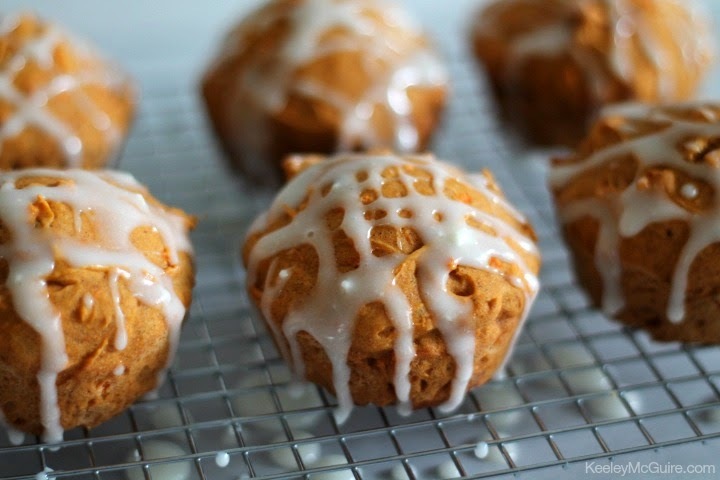 We amped our muffins up by also adding shredded carrots to the batter. 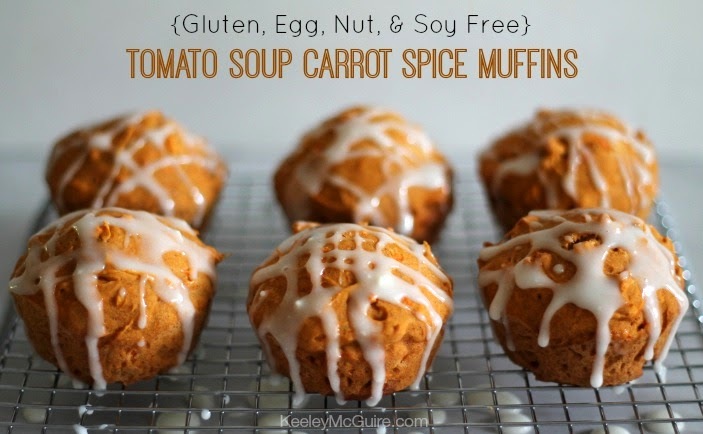 Extra nutrition + the carrots add a natural sweetness to the recipe. The original Tomato Soup Cake recipes all have a thick layer of cream cheese icing. So we made a light glaze instead for our muffins. It's optional, so entirely your choice to add it or not. The recipe widget is at the bottom of this post to print along with a clickable link, in case you cannot view it on your mobile device. 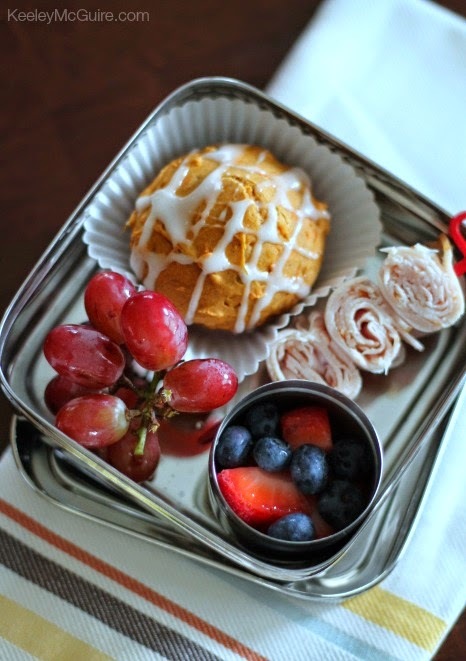 For lunch, we used our ECOLunchbox to include a yummy muffin, turkey roll-ups, and fresh fruit. Awesome giveaway! We homeschool our children but lunches are still on the go. 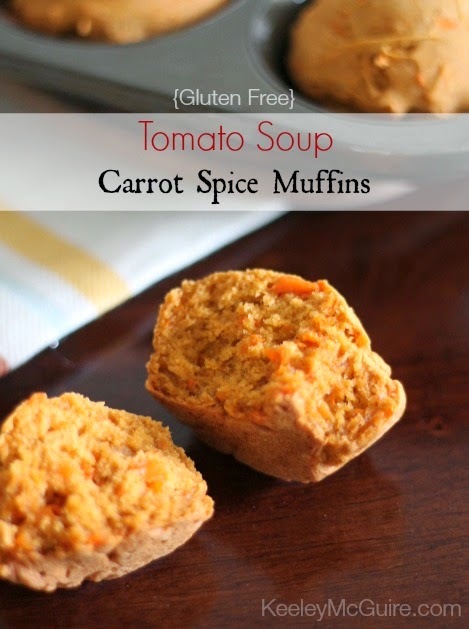 I'm intrigued by the tomato soup muffins...I've never heard of them before! I would live to try these products! Especially the soup. Very cool! Will have to try. My biggest hurdle is finding food that is both gluten free and enjoyable for my fifth grader. My biggest struggle is finding new gluten free products to incorporate so my daughter doesn't get bored with her lunches. I think keeping things interesting for him is important...and hard. We have multiple food allergies and there are only so many things he can take. And he's also bummed about not being able to buy lunch like everyone else. My biggest lunch packing struggle is refrigeration and no heating. Our thermoses don't work well and sandwiches get tiring. What a great giveaway to start the school year! My biggest struggle is definitely variety. I often find myself in a food rut, choosing whatever is easiest, when it comes to making lunch for lil dude. Great give away for a Monday! We are in back to school prep so this is perfect!! This is my first year having to pack a lunch every day for my soon to be 1st grader but even at home my biggest hurdle is making things that are not sandwiches. Esp. this year being at the nut free table I can't send him with any peanut butter alternatives either - it will have to be lunch meat or something else. My biggest struggles are feeding my child who is picky and has allergies and sending warm food for my four year old. He can't get the food out of the thermos. He needs one with a wider mouth. So I send a bowl and the teachers have to help him. Trying to get more variety in my three daughters' lunches. Also, trying to get my oldest, who is on the spectrum, to be more involved in planning and executing her lunches. This would get us off to a great start. Love your blog! It's a challenge to find yummy & healthy foods for lunch for my picky 6 year old, but I keep at it knowing he is getting whole foods from me and not processed from school. Would love to win this so I can make him something yummy! Packing enough to satisfy hungry young men/teens. My biggest struggle is time! I work full time so I need to do all my cooking on Sunday. I love all the great ideas and recipes that you provide! I work nights. So, my biggest problem is packing the right foods to keep me going all night. Variety! I feel like I'm consistently packing the same 5 or 6 things! Variety is my struggle. I try to pack healthy, filling lunches, but run out of new ideas. My biggest struggle is dealing with one child with food sensitivities ... one who is the pickiest child on the face of the earth ... and one who sometimes eats lunch and sometimes is too busy to be bothered. GAH! I'm intrigued by the idea of using soup in muffins. I tend to struggle with monotonous meal planning. And I'm not good with planning ahead. Variety and time management. Preparation. These look amazing! Carrots AND tomato soup? What's not to love? Finding a variety of foods to eat, so they are not getting tired of eating the same things each day. I find the biggest struggle is finding different foods to put in their lunch everyday. I have 3 kids with celiac and 2 that are also dairy free. It feels like I'm giving them the same foods for lunch everyday. This is my first year packing lunches. My biggest struggle so far (only a few days in) is trying to make sure I pack healthy but delicious foods that my 5 year old will eat. On the first day he left his sandwich untouched, on day 2 he didn't eat his apples. Making time to pack a lunch is the hardest of I don't do it the night before! Muffins are a great idea! My biggest challenge to healthy lunch packing is finding good nutritious food items that are yummy for children to enjoy on their lunch break! My biggest challenge is giving a variety of options. We get into a rut with lunches. I struggle giving my son a variety of foods day after day. I tend to give him the same stuff week after week!